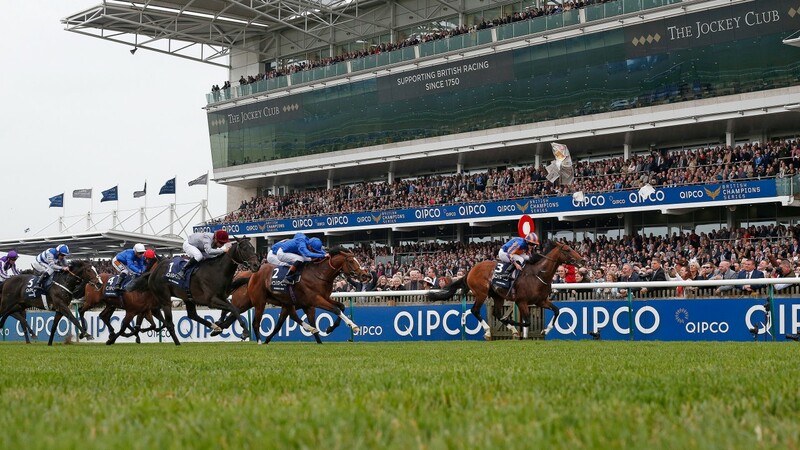 A colt named after the greatest of all world leaders ruled on the Rowley Mile, just as so many had predicted he would, with the beautiful beast that is Churchill converting two-year-old dominance to Classic glory thanks to a wonderfully authoritative triumph in the Qipco 2,000 Guineas. When Coolmore supremo John Magnier's wife Sue handed the son of Galileo and Meow the same surname as Britain's iconic wartime prime minister, she set him a mighty task. He lived up to that task quite brilliantly to give Aidan O'Brien an unmatched eighth win in the showpiece the sport's pre-eminent trainer has come to dominate. As has so often been the case in recent years, Sheikh Mohammed played second fiddle to Coolmore, whose latest champion beat Godolphin's Barney Roy into second, with French raider Al Wukair a strong-finishing third. Churchill's Ballydoyle stablemate Lancaster Bomber took fourth. For Frankel, represented in a Classic for the first time, there was no dream victory with his two runners unplaced, but his legendary stallion father Galileo has yet another outstanding thoroughbred in his own family tree, one, moreover, who could thrillingly line up in the most celebrated of all Flat races, the Investec Derby. 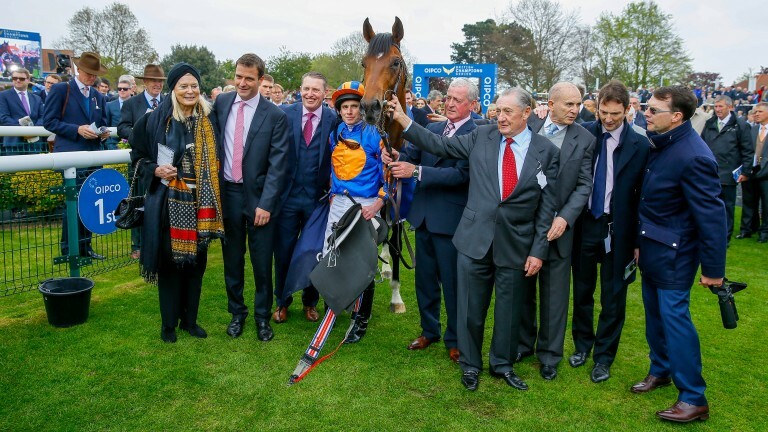 "He's not Frankel, but he's a good horse," said part-owner Michael Tabor, whose blue and orange colours were donned by Ryan Moore in a Guineas in which the simplicity of the success was striking. 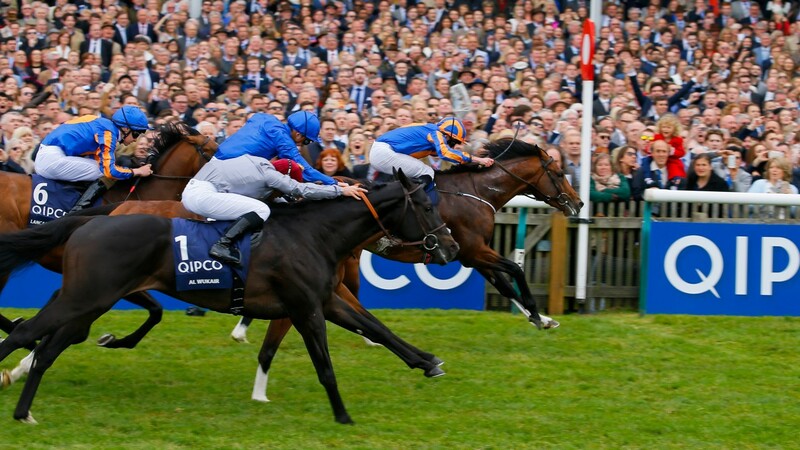 For while the opposition in behind was either stumbling (Barney Roy) or attempting to come from off the pace in a steadily run race (Al Wukair), Churchill, a winner here last October in the Dewhurst, forged clear against the fence, retaining his lead decisively through the final furlong. "My horse does everything the right way," said Moore of the 6-4 favourite, who dazzled in front of a modern-day record 2,000 Guineas crowd of 19,412. "He's a beautiful athlete with a great mind. Through the race he always filled me with a lot of confidence. All his career he's done everything right and he's got better. I couldn't be happier with him. "He's beat the best there was at two and so far he's put up the best performance at three. I think he'll keep on performing and improve on today." O'Brien would surely agree with everything Moore said. Indeed future opponents should note that the man who moved past John Scott – responsible for seven 2,000 Guineas winners between 1842 and 1862 – said somewhat encouragingly: "We're delighted to get him started." Churchill is clearly far from finished. Whether he is now done with racing over a mile is unclear. Bookmakers quote him at between 5-2 and 6-1 for the Derby, to which only two of O'Brien's previous Guineas winners went. King Of Kings ran his last race at Epsom after breaking down on the Downs. Camelot, however, completed the coveted Classic double. "Distance is usually not a problem to a Galileo," said O'Brien. "He can go any route. He got a mile well today and you'd say he'd definitely get a mile and a quarter very well. With a mile and a half you're never sure, but I'd say he could go down a lot of roads." Asked the same question, Moore's answer was one that made you listen. "Well, look, I mean . . . his daddy won a Derby," he said, adding: "I doubt there would be a better ride." It will be 'the lads' – Magnier, Tabor and Derrick Smith – who decide. One of the two lads in attendance played a straight bat when asked to ruminate on Churchill's chance of excelling over a mile and a half. "If we knew that it would be easy," said Tabor. "If you know they're going to stay a mile and a half they usually haven't got the speed. He has the speed. Only time will tell – if he ever does run in the Derby. "When you own a horse like this you have rose-coloured glasses on. That's the truth. You think the horse can do anything. I would like to think he'd get the trip, but I don't know. "We have plenty of other horses who could be Derby horses. I'm not ruling it out, though, not at all. We'll see how the other trials go. Who knows? Something could come out of the pack who looks unbelievable. Do you run Churchill then as well? "All of us want to win the Derby, whether it's Derrick, John or myself. The Derby is the Derby. It's special. We'll see." Also special is Churchill, gorgeous to the eye, sublime at the gallop and a 2,000 Guineas winner worthy of the man whose name he boasts. "Great man, great horse," said Tabor. Quite right.